(Seychelles News Agency) - Seychelles will receive assistance from the Indonesian National Narcotics Agency to help rehabilitate the users of illegal drugs under a newly signed Memorandum of Understanding. The agreement was signed on Monday by Patrick Herminie, the Secretary of State for the prevention of drug abuse and rehabilitation, and Heru Winarko, the chief of the Indonesian National Narcotics Agency. Under the agreement, the Indonesian National Narcotics Agency will provide all necessary equipment needed to ensure the running of a new rehabilitation centre which will be built this year at Cap Ternay in the western Mahe district of Port Glaud. Training will also be given to locals under the agreement. The centre will be financed entirely by the government of the United Arab Emirates. “We are starting by sending seven of our highly motivated recovering addicts to Indonesia this year. Chosen by psychiatrists and psychologists, they will spend six months there where they will undergo a complete rehabilitation without the use of any drugs and then they will come back and work with APDAR (Agency for the Prevention of Drug Abuse and Rehabilitation),” said Herminie. Research conducted by APDAR in 2017 showed that there are around 5,000 heroin users in Seychelles, an archipelago in the western Indian Ocean with a population of 95,000. After the six months, the reformed addicts will work at the rehabilitation centre which will operate as a therapeutic community. Hermine added that the centre at Cap Ternay will be a smaller version of Lido, a rehabilitation centre in Indonesia. It will have the capacity to accommodate 100 clients – 35 male adults, 15 female adults, 25 boys and 25 girls - at a time. “Indonesia is a country with a lot of experience when it comes to the fight against drug abuse. They have one of the most modern rehabilitation centre in Asia, if not one of the best in the world,” he said. The Indonesian delegation paid a visit to President Danny Faure at State House on Monday. The Special Envoy of Seychelles at the Association of Southeast Asian Nations (ASEAN), Nico Barito, said that Seychelles needs practical experience to tackle the drug problem. “Indonesia and Seychelles have almost the same culture and I think that the two countries can share the common know-how on how to combat drugs and do good prevention. 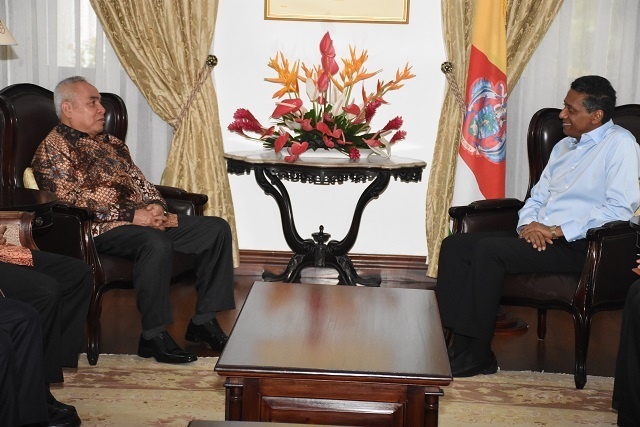 Hopefully, this effort is very supportive to the government of Seychelles and the commitment of the president,” said Barito. The delegation is expected to visit the site where construction will take place.